This my review of a Slingbow sent to me by Slingbow Industries. The owner of the company shipped me a box with the Weasel Jimmy Package which sells for $199.95 on their website. 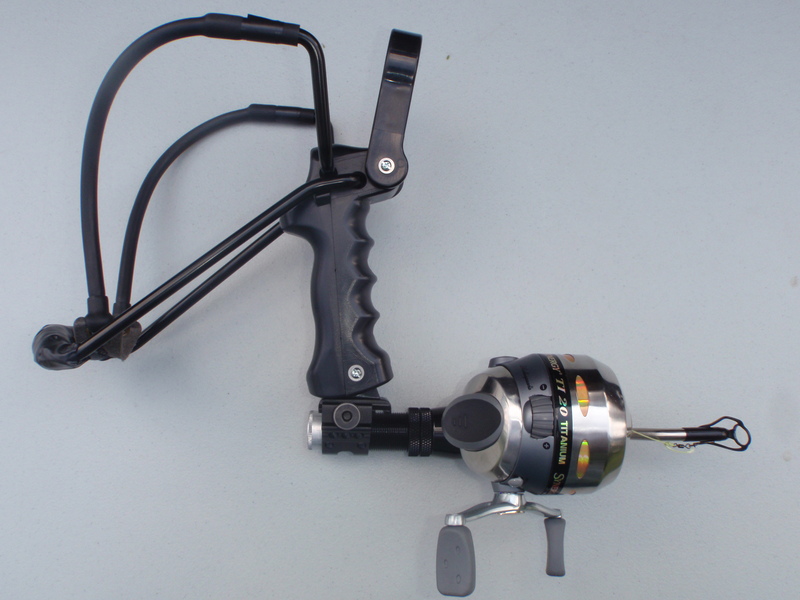 Shakespeare TI-20 reel loaded with 200# Monkey Wire and the RPM Bowfishing Power Rod Extension. This kit also includes the Slingbow Industries Reel Seat and Reel Seat Adapter and a 45-degree offset Picatinny Rail Mount. The Weasel Fishing Package comes standard with 30# draw-weight bands prepped for archery. It can be upgraded to 35# draw weight bands for carp and gar fishing. A sample fishing arrowhead is provided. I also received 3 take down carbon arrows, steel shot 40# hunting bands, 3 fishing spear points, 3 field points and a fancy keychain/bottle opener for when you want to have that cold one while out fishing. 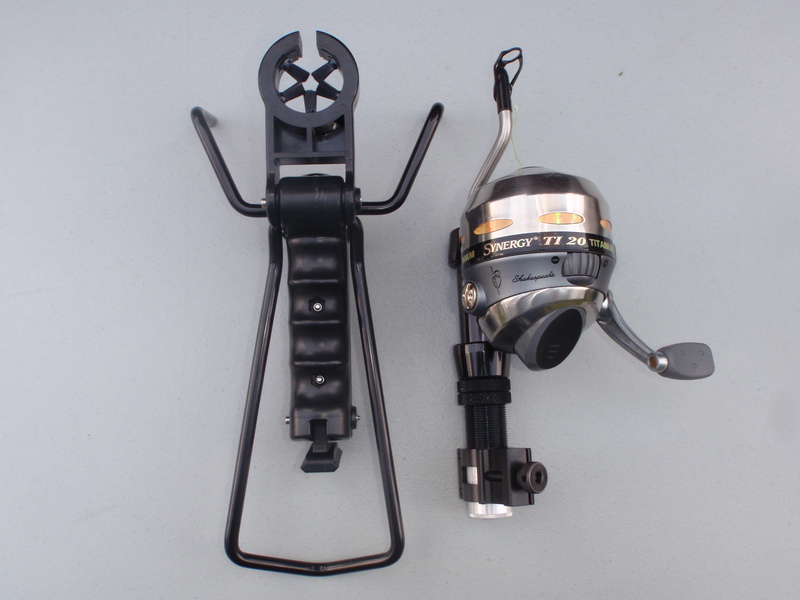 When I first got everything unpacked and assembled the reel to the slingbow the reel cracked. I called Matt(the owner) and he shipped a replacement out right away free of charge. There is also an allen wrench in the slingbow so that you can lower the arrow rest and shoot standard ball ammo. I will tell you now that it you are used to using bow sights, this takes getting used to. Instinctive shooting is what you will have to learn. This slingbow took me back 20 years and retaught me what I had forgotten. My first bow had no sights so I taught myself to Instinctive shoot. I started out shooting at a cotton ball 10 feet out. Eventually after many months of practice there was nothing that I could not hit and kill. If I had a gap between tree branches 2 inches wide and a deer on the other side. I could put that arrow where it needed to be. Later on with painted brass pin sights and peep sights and even light gathering sights for bows. I got lazy. This slingbow took me back to my roots of Instinctive shooting. Shooting 20 – 30 feet out is a breeze for rabbit or tree rats. Anything beyond that is a challenge ESPECIALLY with a cross wind. At 200 FPS you will struggle in a high cross wind to hit your target more than 20 yards out. It took more practice because of the deflection of the water when slingbow fishing, however it was more up close and personal. Here in Illinois it is Illegal to hunt with a slingbow. However, with the tests that I have done with a 1 inch muzzy broadhead in my arrows. I would feel sure that I could take a turkey. If we could get 50# bands Deer would be a piece of cake. Over all this thing is well made and a lot of fun to shoot and fish with once you get past that learning curve of instinctive shooting. This will make a nice addition to my survival bag that I carry in my truck daily. The 2 piece carbon arrows are nice they break down and can easily be stored in a pack. The 30# bands make it easy for even a teenager to use. Thanks to Matt as Slingbow Industries for allowing me to use his product and have fun while doing it. Here is a link to their website and their products. Visit my website as well for more survival information and many DIY projects. We were really interested to get your thoughts on out product. We know you have seen a lot of what's out there and we appreciate your constructive comments. We are looking to continue to build better and better gear for preppers and folks who just like being outside. Your input is valuable in that regard. I got your emal also. Thanks a bunch. Great job. You have distinguished yourself from many other people I have worked with and sent samples to in that you actually followed through with what you promised. I know that may not sound like a big deal, but that actually makes you very different from many others and it is greatly appreciated. We are working pn a redesign of takedown arrows and I was wondering, once we get a working prototype, if you would like to test/review those. I look forward to testing out the new arrows when you get them done.